As more diet trends hit society, it’s getting more and more overwhelming to shop the aisles of the grocery store. Does “gluten-free” mean it’s inherently healthier for you? Just because something is labelled as “light” makes it superior? And how in the heck can a food be zero calories?? Don’t give up! I can help! The food industry is massive and they’re able to use their packaging, advertisements, and even shelf placement to their advantage to reel you in as a consumer. They’re also greatly benefitting from the fact that dieting is trendy, and will label their items accordingly (cough, cough, low carb anyone??). As somewhat of a follow-up from my previous post about unhealthy health foods, I wanted to talk about the nutrition claims companies put on their packaging. I mentioned how consumers need to be critical and aware when shopping, and these claims are one easy way we can be tricked. 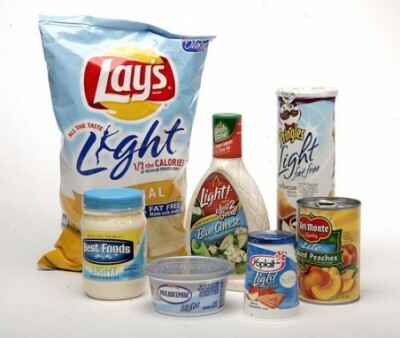 So many foods are labelled with claims to draw the consumer in, such as “light”. This automatically makes people think the food is a healthy (or healthier) option. Knowing what standards these claims have to meet can be helpful – be informed! Finally, calling something “light” or “lighter” means it has to meet the same standards as calling it “reduced” as noted above. 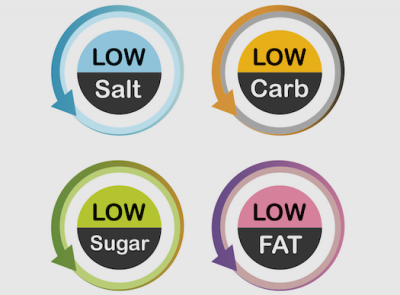 *It’s important to note that in order to make a food “low fat” or “fat free”, a company may have swapped out a healthy fat source and replaced it with something less healthy, like a sugar, to make sure it tastes great and is appealing to you. Don’t just read the label on the front of the package, but be sure to check the nutrition facts table, too! As noted above in all the claims, it’s based on the serving size – which may or may not be what you choose to eat! If the nutrition facts of a cookie is based a serving size of two cookies, and you eat four – be sure to double all the nutrient information. Some serving sizes will be written in weights (grams, mL, ounces, etc. ), or it may be per item or package (half a package, half a bar, etc.). You need to match what you eat to the serving size listed to figure out what you’ve actually eaten in terms of nutrients and calories! Note that a serving size is ONE pastry (even though two come sealed together). Also – look at all the “healthful” claims Pop Tarts can make! It’s clear why someone may think this is an acceptable breakfast choice to make. This entry was posted in Education, Food, Health, Nutrition, Wellness and tagged eat clean, eat healthy, food, food claims, health, health canada, healthy eating, nutrition, nutrition claims, wellness. Bookmark the permalink.